'At the Edge of Light', upcoming tour, Genesis, GTR and guitar techniques. Steve Hackett Talks Favorite Genesis Moments, Joe Bonamassa and New Album, 'At the Edge of Light'. Interviews and features relating Steve's solos album: At The Edge Of Light. Prog legend on his 1957 Gibson Les Paul Goldtop. Steve discusses the writing of Fallen Walls and Pedestals from his new solo album 'At The Edge Of Light'. Eric Sandberg interviews Steve on all things Hackett. Steve discusses the writing of Underground Railroad from his new solo album 'At The Edge Of Light'. Check out splendid cover feature on Steve in the current issue of Prog Magazine! Steve discusses his new solo album - At the Edge of Light. Steve discusses the writing of Under the Eye of the Sun from his new solo album. Steve discusses the inspiration for the track 'Under the Eye of the Sun' from his new album - At the Edge of Light. Steve discusses Genesis, and the forthcoming Band and Orchestra tour. Steve talks about his forthcoming Band and Orchestra tour in October. Steve chats about his touring, collection, being in Genesis, guitars and more. Steve chats about his forthcoming Band and Orchestra tour in October. An interview on all things Hackett guitar related! Video interview - Listen to Steve's incredible stories from his life in music! Video interview - A guitarra elegante de Steve Hackett. With video excerpts. Audio interview - Mystery Tour - Steve talks to Mickey E.Vil. Fame and Fortune feature - My earning power with Genesis was a revelation. Audio interview plus transcipt - Scott Medina asks Steve about Solo albums, Genesis, GTR, Djabe & Squackett. 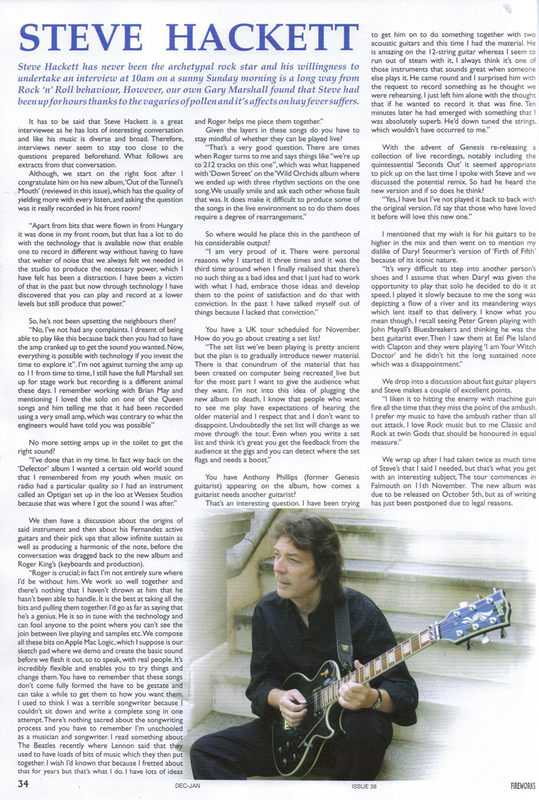 Yorgos Goumas and Emiliano Jorge interview Steve Hackett (interview in Spanish). On his recent projects, his beginnings and also his special look on music as a universal language and bridge of union between different cultures. Video interview - Metal Matt interviews Steve Hackett from the Serrano Hotel in San Francisco. FERNANDO CANALES interviews Steve Hackett in Argentina (interview in Spanish). Steve Hackett brings Genesis Revisited tour to New Jersey. Guitar Legend Steve Hadkett talks about his 2018 tour, new releases. Several videos interviewing Steve on all things Hackett. Steve Hackett brings his Tour de Force to Collingswood. Steve Hackett celebrates Genesis: 'I do love the music'. Genesis guitarist Steve Hackett rocks a progressive party in St. George. Steve Hackett on crafting tour setlists, Canadian Genesis Fans, and servicing the band's namesake. Anecdotes and insights from Steve. Half hour conversation with Steve on all things Hackett. At music venue Trading Boundaries discussing acoustic performances, the influence of world music and exciting new albums released in the past year. Interspersed with live music from the shows. Steve discusses his ancestors, refugees, music from around the world and The Night Siren. Steve Hackett on 'The Night Siren'. Steve Hackett on 'The Night Siren', Chris Squire's legacy and rediscovering a lost Genesis song. The Acoustic Storm's Jeff Parets spoke with Steve Hackett via phone. The Night Siren is my most ambitious CD to date! Interview with Steve on GTR. Interview with Steve regarding Chris Squire, Yes and more. One hour conversation with Steve. ACOLYTE, ARTIST, GUITARIST, VOYAGER: Interview with Steve Hackett by Blurt Online. Acolyte to Wolflight - a converstaion with Steve. Cals Prog Rock Show - interview with Steve, March 25, see download link for the MP3. Interviews and features relating to touring in 2016. Steve Hackett, Eternal Acolyte - embraces past and present. Dave J interviews Steve on live and studio work. Two in depth interviews with Steve - "How to tame your axe & other stories" & "Tell us about your latest projects, Mr Hackett"
GTR - "Making a noise for a living"
Steve Hackett talks Wolflight, phrasing and the nylon knack. Steve Hackett discusses his new album, 'Wolflight' and other Hackett & Genesis related subjects. Steve talks about his forthcoming South America tour, Genesis revisited and his new album Wolflight. Steve Hackett, the legendary Genesis guitarist, calls in to talk about his Genesis Revisited project, the album, the tour and also goes deep into how a few of the Genesis classics came about. Steve talks candidly about the reunion rumors as well and what it was like to be in such an important band. Truly an honor to speak with such a legend. 40th anniversary of "Selling England by the Pound"
Genesis guitarist Steve Hackett joins Perry Bax on The Best Radio You Have Never Heard for a chat about Steve's new album Beyond the Shrouded Horizon, the early days and the future of Genesis, along with some great music from both Steve's solo career and with Genesis. Discussions on new album and more! TV interview with Steve in Fasano. If the brevity of Hackett's answers is any indicator, he's a fellow who prefers to let the music do the talking. So what artists and works have spoken to his artistic soul? An analysis of Steve Hackett's guitar work including an exploration of the difference between the original Genesis albums and the 5.1 re-mixes. Presented by Leigh Harris. Steve Hackett: "Everything is possible in music!" Steve talks to Joe Reilly before the Ottawa Cisco Bluesfest show on July 8th, with clips from the show. A Glad you like it - I'm hoping it's a new home for fans as well as me. I'm actually very proud of the way it looks already but I'm also very excited about some of the ideas we have for developing it further. Q So why the move now? A Well as you may know I went through a divorce last year and in the aftermath of that I felt a need for greater autonomy, to be honest both personally and professionally. Your life gets turned upside down in these situations but it doesn't half fuel your creativity. I'm positively bursting with new ideas. Q So is there new material in production? A Definitely electric, or 'rock' if you prefer, but my passion for nylon guitar is well known, so you can expect it to feature heavily. Q So does this mean we can expect a new album in the near future? A Actually, we have two or three projects on the go at the moment, including a collaboration with Chris Squire. Q Yes, I saw an interview with Chris where he mentioned that he had been working with you, in fact he was very complimentary. A Praise from Chris means a great deal. I've long been an admirer of his playing actually, and he's a great writer and singer too, so it's a real privilage to work with him. I contributed some guitar work to his Christmas album last year, which was fun, and things just went from there. He's a busy man, of course, currently touring North America with Yes, but the internet's a wonderful thing isn't it, so we can just ping MP3s across the pond. Q So is this the new technophile Hackett in operation? A Well we tried mailing 78s but it turns out that they don't fit through letterboxes, and even guitarists have to embrace technology from time to time. Q Roger King's sleeve notes for the recent "Tribute" album allude to your penchant for 78s. A Not 78s per se, I think the reference was to the wire recorders used in the twenties, but I have a great fondness for the warmth of those early recordings - it's a sound we endeavoured to capture for the "Tribute" recordings, 'new wine in old bottles' if you will. I'm very proud of it, both the playing and the production - I think we managed to look backwards and forwards at one and the same time. Q Talking of retrospectives, the new Genesis box set is out now with alternative mixes and previously unreleased material. A Yes, the original mixes were very much of their time, and none the poorer for that, but the new mixes certainly bring a fresh perspective. Nick Davis did a terrific job on them - the guitars on those albums have never sounded finer. Q I assume the answer is no but I have to ask - any chance of a reunion of the classic Genesis lineup with you on guitar and Gabriel singing? A There's still every chance that the class of 75 could reconvene at a moments notice as the Genesis name still carries such affection with audiences throughout the world. I'm just one of five, though. But my enthusiasm for touring remains undiminished. Q So does that mean we might see you on stage in the near future? A Yes. We have some Italian dates in the pipeline for early 2009 and every likelihood of more to follow - I'm really looking forward to taking the full electric band out. Meanwhile I'm busy juggling recording and touring commitments. Q I notice incidentally that you have made several appearances with the Hungarian band Djabe. Does this indicate a new direction for you? Q So might we see a new lineup for the gigs next year or will the band comprise familiar faces? A Well things have changed behind the scenes, as I mentioned, but I'm happy to say that many of the old crew will still be manning the ship. No doubt there will be new recruits too. Watch this space! A Yes, Roger continues to be an integral part of the operation, but I'm also deeply indebted to Jo Lehmann who has helped steer the ship through choppy waters, both creatively and administratively. Brian Coles, Nick Clabburn, Harry Pearce and Manda Lehmann continue to be worthy navigators too. Q You're obviously optimistic about the future. A You bet. Onwards and upwards! Many thanks.